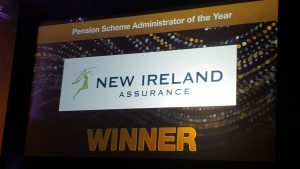 The winners of the Irish Pension Awards for 2018 were announced at a ceremony held at the Shelbourne Hotel, Dublin on 22nd November. These awards recognise pension providers and fund managers who have proven their excellence, professionalism and dedication in pension provision over the past year. We were delighted to win the prestigious Pension Scheme Administrator of the Year award for the fifth year in a row. It was also great to see a number of our investment partners being recognised with Legal & General Investment Management, Insight Investment and Lazard Asset Management also picking up awards on the night.